Towards the beginning of Thor: Ragnarok, Thor loses his trusty hammer, Mjolnir. After throwing it at his sister, Hela, she grabs it and simply destroys it. The mighty Mjolnir is destroyed. Thor resorts to using a number of mundane weapons throughout the rest of the movie. In his gladiatorial battle against the Incredible Hulk, he uses a s club and shield. And when he comes face to face with Hela on Asgard, he dual wields two swords. However, it appears he will have a brand new weapon for the upcoming Avengers: Infinity War movie. A new Funko POP collectible with the Avengers: Infinity War label shows Thor wielding a brand new weapon. 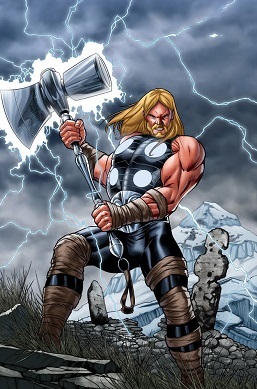 The weapon the Thor collectible is holding appears to be the ax/hammer wielded by Ultimate Thor. The Ultimate Thor’s Mjolnir recently showed up in the Marvel Universe and Odinson claimed it as his new weapon in The Unworthy Thor #4 by Jason Aaron and Olivier Coipel back in February of 2017. However, Funko POPs don’t always end up looking exactly like their on-screen counterparts. In fact, the Thor: Ragnarok Funko POP shows Thor with both of his eyes. In the movie he actually loses one of his eyes to Hela and now sports an eye patch. It’s possible the Avengers: Infinity War Funko POP design could just be based off of concept art and the the Ultimate Mjolnir might not show up in Avengers: Infinity War at all. In fact, a Lego set shows Thor with his axe, Jarnbjorn. Do you think the Ultimate Mjolnir will show up in Avengers: Infinity War or will Thor use another weapon like his axe, Jarnbjorn? Avengers: Infinity War hits theaters on May 4, 2018. Chris Hemsworth stars as Thor and he will have a brand new weapon one way or another!